The BBC has announced it will offer iPhone applications for its news and sport content from April. The free apps will be followed by versions for BlackBerry and phones running Google's Android software. The BBC said they had been developed because more people use "sophisticated handheld devices" to view content. 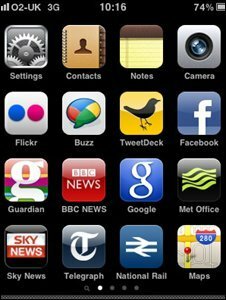 Several other news organisations offer iPhone apps, including Sky and the Daily Telegraph - which are free - and the Guardian - which costs £2.39. Analysts at research firm CCS Insight said the apps would "increase tension between publishers of paid-for content and those reliant on other revenue". The news industry is currently struggling to find a business model for the digital world. "Whilst the BBC's impulse to enter an already crowded news and sport apps market place is understandable, the move belies the fundamentally competitive nature of the Corporation's approach to new services," Emily Bell, director of digital content at the Guardian, told BBC News. "Applications are a long way away from being 'broadcast' media, and, unlike the web, they form a market which the BBC is seeking to disrupt." In addition, she said, the "considerable cost" of developing apps for all platforms meant the BBC was in "territory most publishers could not afford to inhabit". But Erik Huggers, BBC director of future media and technology, said the BBC audience "want to access the digital services that they have paid for at a time and place that suits them". "Today's announcement means that we are catching up with our audiences," he told the Mobile World Congress in Barcelona. The news app, to be released in April, will offer content from the BBC News website, including written stories, correspondent blogs as well as audio and video. Users will also be able to send comments and pictures directly to the newsroom. The BBC said the sports app will be released in time for the World Cup, which starts in June, and will initially focus on football. It will combine content from the BBC Sport website and 5 Live radio, including live commentary and scores, and will allow fans to watch sports matches live on their phone. The apps will be updated later in the year to include more content, including Formula 1. A different version of the apps will be offered to international audiences, supported by advertising. The BBC said it was also considering releasing apps later this year for its popular iPlayer service. The on-demand video and audio player serves up 20 million requests for TV and radio programmes every week. The BBC has said that it will initially focus on building applications for the iPhone but follow with applications for Google's Android operating system and RIM (BlackBerry). It said it would also "work with other providers to enable these applications on their mobile devices". However, the organisation did not mention specific plans for an app for Symbian, the world's most popular smart phone operating system. According to figures from analysts CCS Insight, Symbian software is used on 47% of all smartphones. BlackBerry accounts for 21% of the market, compared with Apple's 15%, Microsoft's 9% and Android's 5%. The BBC does however already offer a BBC iPlayer app for certain Symbian phones. Jim Killock, of the Open Rights Group, said that the BBC should concentrate on developing "open platforms" rather than building apps for closed systems such as the iPhone. "That way everyone can access the content regardless of what device they are using," he told BBC News. Several unofficial apps already exist on Android handsets and the iPhone.